It’s almost that time again: the Larimer County Fair & Rodeo! This year’s fair will take place August 2-6 at The Ranch. Enjoy a huge carnival with hundreds of rides and games, a PRCA rodeo, 4-H and open class exhibits, livestock and animal shows, live music and entertainment, a brew festival, antique tractor show, petting zoo, fireworks, a queen contest, junior livestock sale, parades, a pancake breakfast, great food, good times, and so much more! It’s always free to attend and park, so make it a family tradition. If you feel like getting in on the action, there are still volunteer opportunities available. Please consider joining the Larimer County Fair & Rodeo as a “Ranch Hand” and become an important part of one of the best fairs in America. There are many ways to help out, including serving at the Pancake Breakfast, assisting with special events, driving a Hospitality Shuttle, or helping with the junior livestock sale. Taking place a week before the Larimer County Fair & Rodeo, be sure to catch the annual parade. Held in downtown Loveland, this year’s fair will begin at 9:30 a.m. on July 27. The Larimer County Dog and Pony Variety Show will be held on August 3 in the Ranch-Way Feeds Indoor Arena. The carnival is open weeknights from 4 p.m. to midnight, and noon to midnight on Saturday and Sunday. On August 2, join The Ranch’s Toast to Agriculture, a 4-H and Colorado State University Scholarship Fundraising Dinner. Located in the Private Party Tent outside the main door of the indoor arena, the meal is open to the public and is made from the products of local Northern Colorado farms. 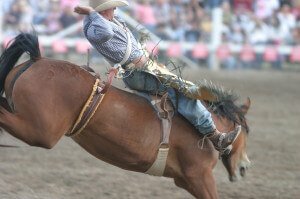 These are just some of the great events held every year at the Larimer County Fair & Rodeo, along with many more. I really do encourage you to bring your family to this great local event, support 4-H, and enjoy yourself with all the fair has to offer.